the blue lines above show the path of the tracts included in the anterolateral system. 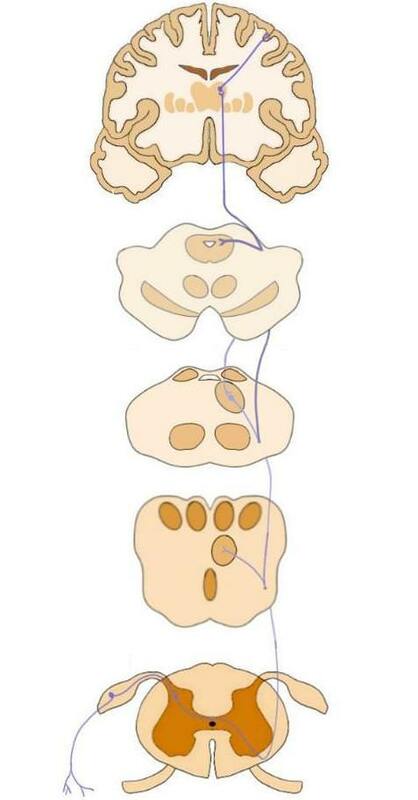 refers to a collection of ascending pathways that carry pain and temperature--as well as related touch--sensations from the spinal cord to the brainstem or thalamus. The anterolateral system is generally considered to contain the spinothalamic tract, spinoreticular tract, and spinomesencephalic tract. Watch this 2-Minute Neuroscience video to learn more about the anterolateral system.